From the bottom of our hearts, Project Boon would like to say a special “Thank you!” to everyone who made last week’s Eat & Be Well event a huge success! 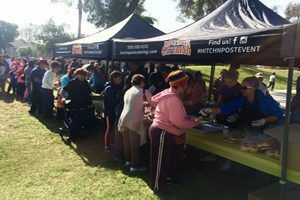 Last week on November 23rd, the day before Thanksgiving, Project Boon brought together over 1,500 Inland Empire residents in need, 46 vendors and 250 volunteers for its 5th Annual Eat & Be Well event at Fontana’s Seville Park. Every year, Eat & Be Well spreads the holiday spirit to those in need by providing free Thanksgiving meals with all the fixings, games for kids and health and wellness booths including free haircuts and flu shots. In addition to all these festivities, this year’s event also features entertainment by The Jam Farmers and DJ Fish. In just two weeks, Project Boon will be headed down to serve children and their families in Barranca, a tarp city south of Tuxpan in Jalisco, Mexico for Operation Devolver. Electricity and running water are sparse in Barranca, as are basic household and school supplies. But 3 times a year, Project Boon visits this tarp city to provide much needed and appreciated necessities including canned food and household supplies. 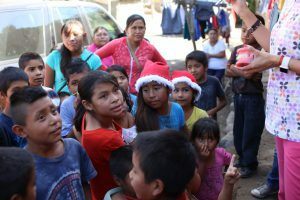 With Christmas just around the corner, Project Boon will also be playing the role of Santa Claus as they bring hundreds of gifts for the children of Barranca. Also this year, we are excited to announce our strategic partnership with Inland Valley Recovery Services. At IVRS’ Project Boon Winter Holiday Event, we will be offering food, toys & health services to the San Bernardino Recovery community. While our December events are coming soon, there’s still time to donate to help make these events a success. Click here to support the Project Boon December events. Project Boon events are supported by everyday donors like you, as well as the friends, families and business associates of Project Boon founders Chris and Karina Suchánek. 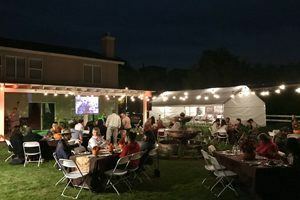 The Sucháneks recently hosted a fundraiser event for both Project Boon activities at their home with live entertainment by DJ Fish, Pomona Queen beer from Last Name Brewery, a wine bar and a paint night where participants followed step by step instructions to paint a flower in a bottle. Guests were encouraged to bring toys, canned food and monetary donations for Project Boon’s holiday events. Guests also had the chance to enter into a special raffle for a Fat Tire bike donated by Glendora Dodge. The fundraiser event was a huge success, drawing over 100 donors and guests. The Sucháneks and Project Boon staff members would like to thank all the fundraiser attendees, especially Maya Ivanova of Wilson Ivanova CPA, the largest donor of the evening and turkey sponsor for this year’s Eat & Be Well! Project Boon is all about giving back to underserved communities. We gladly accept donations, both monetary and material, to support our numerous events. Visit our site for more information on how you can help.